Scattering the ashes of a loved into the ocean can be an extraordinarily beautiful way to say goodbye. Many people love the idea of the ocean teaming with life. Many of our requests are related to the ocean, the whales and/or the wildlife having been a special place of signifigance to the deceased. Typically we travel out of the harbor about 45 minutes or so, come to a rest at which point the ashes are released. Flowers are often tossed into the water after which the vessel encircles the area and returns to port. We have also had requests for ashes to be scattered "amongst" the whales for some people who had experienced a special connection with the whales. We recommend using biodegradable urns, as this ensures all of the ashes make it to the sea. It is also nice to watch the urn drift near the boat amongst the flowers and then eventually disappear beneath the surface. One of our charters even made their own paper "boat" which sank after about 5 minutes. You can do this yourself – you do not need a licence to spread ashes in tidal coastal waters off of the British Columbia. Typically, there is no ceremony per sey, however, we can accommodate you if you wish to arrange a member of your religious denomination to conduct a cermony. Doing this by boat as opposed to from the shoreline also lessens the chances of you being intruded upon. This is truly a journey of the heart and however you wish to say goodbye, in silence, spoken out loud or written on our heart shaped post-its for privacy. Your family will set the ashes free by gently lowering them into the ocean. You will then bear witness as the ashes’ transition into clouds that take shapes and colors. This cloud will stay together in a loose formation and begin a brand new journey. 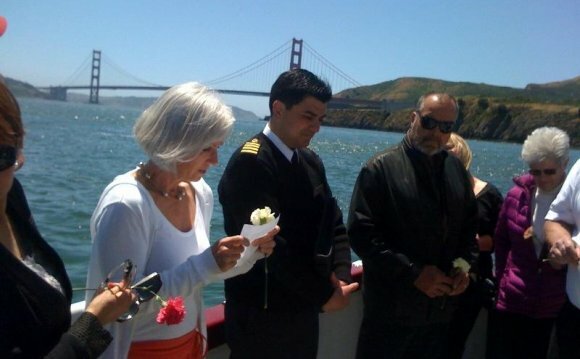 We will ring the ship’s bell eight times (“End of Watch”) and on the last bell everyone tosses flowers overboard. This is the last act of letting go. We return to port while the ashes join the rest of life on their way to another world. Where can you scattering human ashes? What to do with cremated ashes? What to do with cremation ashes?